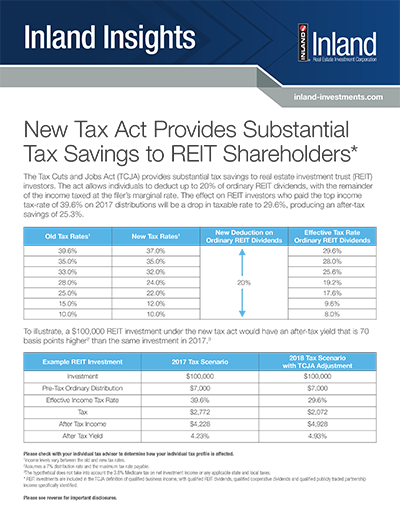 The Tax Cuts and Jobs Act (TCJA) provides substantial tax savings to real estate investment trust (REIT) investors. The act allows individuals to deduct up to 20% of ordinary REIT dividends, with the remainder of the income taxed at the filer’s marginal rate. The effect on REIT investors who paid the top income tax-rate of 39.6% on 2017 distributions will be a drop in taxable rate to 29.6%, producing an after-tax savings of 25.3%. The IRS typically breaks REIT distributions into three categories: 1) ordinary income, 2) capital gains and 3) return of capital. In 2017, an individual in the highest tax bracket paid 39.6% on ordinary REIT distributions. In 2018, there are two new factors: 1) a deduction up to 20% for the ordinary income portion of a REIT distribution and 2) a lower tax rate. An individual in the highest tax bracket in 2018 will pay 29.6% on ordinary REIT distributions. In the 2018 Tax Scenario, multiply pre-tax ordinary distribution by the effective income tax rate ($7,000 x 29.6% = $2,072), then subtract that from the pre-tax ordinary distribution to get the after tax income ($7,000 - $2,072 = $4,928). Please check with your individual tax advisor to determine how your individual tax profile is affected. 1Income levels vary between the old and new tax rates. 2Assumes a 7% distribution rate and the maximum tax rate payable. 3The hypothetical does not take into account the 3.8% Medicare tax on net investment income or any applicable state and local taxes. *REIT investments are included in the TCJA definition of qualified business income, with qualified REIT dividends, qualified cooperative dividends and qualified publicly traded partnership income specifically identified. This is neither an offer to sell nor a solicitation of an offer to buy any security, which can be made only by an offering memorandum or prospectus that has been filed or registered with appropriate state and federal regulatory agencies and sold only by broker dealers and registered investment advisors authorized to do so. An offering is made only by means of the offering memorandum or prospectus in order to understand fully all of the implications and risks of the offering of securities to which it relates. A copy of the applicable offering memorandum or prospectus must be made available to you in connection with any offering. New legislation, new regulations, administrative interpretations or court decisions could significantly change the tax laws and these changes may affect the taxation of a stockholder. You are urged to consult with your own tax advisor with respect to the status of legislative, regulatory or administrative developments or proposals and their potential effect on an investment in a REIT. The views expressed herein are subject to change based upon economic, real estate and other market conditions. These views should not be relied upon for investment advice. Any forwardlooking statements are based on information currently available to us and are subject to a number of known and unknown risks, uncertainties and factors which may cause actual results, performance or achievements to be materially different from any future results, performance or achievements expressed or implied by these forward-looking statements. acts of nature, such as hurricanes, earthquakes, tornadoes or floods.